Figure 1: 1 Hourly Flash Flood Guidance (FFG) on 26 November 2018 at 06:00 UTC (13:00 PM local time). Flash flood would possibly occur within next an hour (14:00 PM local time) at some areas in Binh Thuan and Ninh Thuan province of Viet Nam. Please download the file attached for more detail. Figure 2: 3 Hourly Flash Flood Guidance (FFG) on 26 November 2018 at 00:00 UTC (13:00 PM local time). 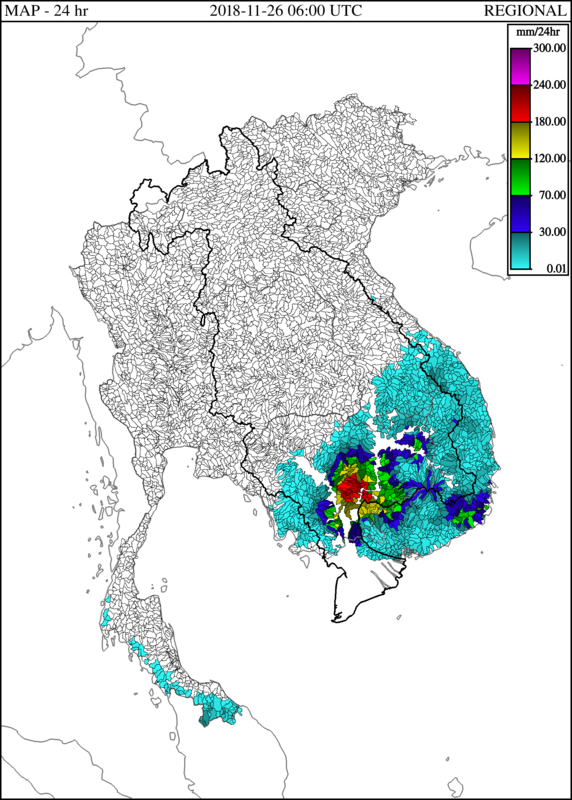 Flash flood would possibly occur within next 03 hours (16:00 PM local time) at some areas in Binh Thuan, Phu Yen and Binh Thuan province of Viet Nam. Please download the file attached for more detail. Figure 4: The last 6 Hourly Average Soil Moisture (ASM) condition (upper soil zone) up to 26 November 2018 at 06:00 UTC (13:00 PM local time). The ASM fraction reaches the saturation level in Cambodia. Figure 5: The last 24-hourly Mean Areal Precipitation (MAP) from 06:00 UTC (13:00 AM local time) on 24 November 2018 to 06:00 UTC (13:00 AM local time) on 26 November 2018. 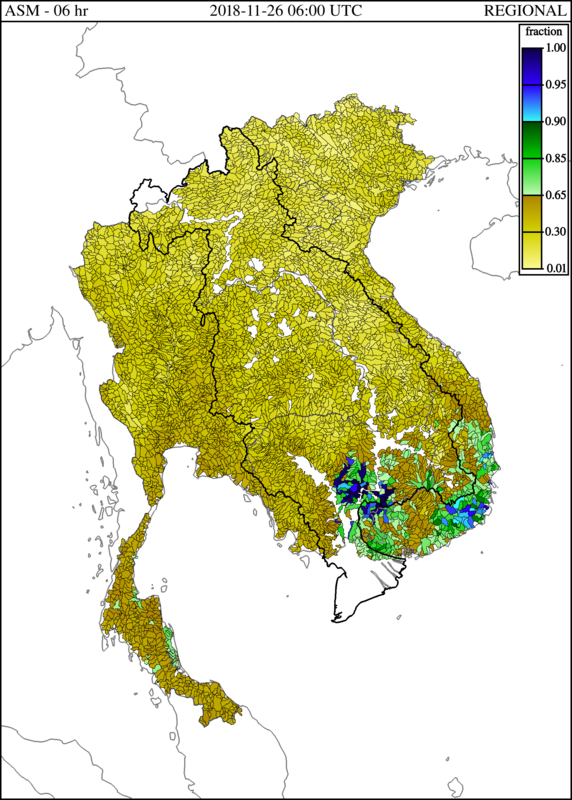 The heavy rainfall occurred in some areas in Cambodia. Figure 6: The last 01 hourly Mean Areal Precipitation (MAP) on 26 November 2018 06:00 UTC (13:00 AM local time). 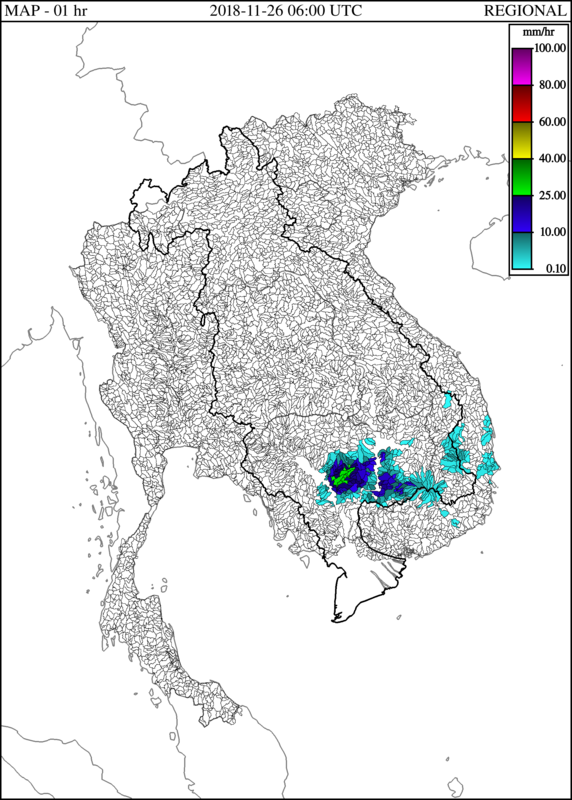 The moderate rainfall occurred in some areas in Cambodia due to the last 01 hour.